Cocoyoc is one of the many colonial haciendas near Mexico City and throughout the Yucatan that were once thriving sugar mills, tequila farms, coffee plantations, silver mines, and other productions centers between the 16th and 19th centuries. Now boutique hotels that combine Mexico's history and culture, haciendas offer an elegant and sophisticated wedding option for couples who want to skip the beach! Cocoyoc boasts lush gardens, fountains and a waterfall, and an old-world feel with its arches and stone walls. Owned by relatives of the bride, the grounds were perfect for their romantic Mexico destination wedding. This image was made directly after their First Look. I love the flow of her veil, the way the arches frame them and genuine smiles they are giving each other. Hacienda Cocoyoc is set in a restored 16th-century monastery and hacienda surrounded by acres of lush gardens. The grounds also feature the remains of a 16th century aqueduct and a Spanish chapel perfect for intimate wedding ceremonies. 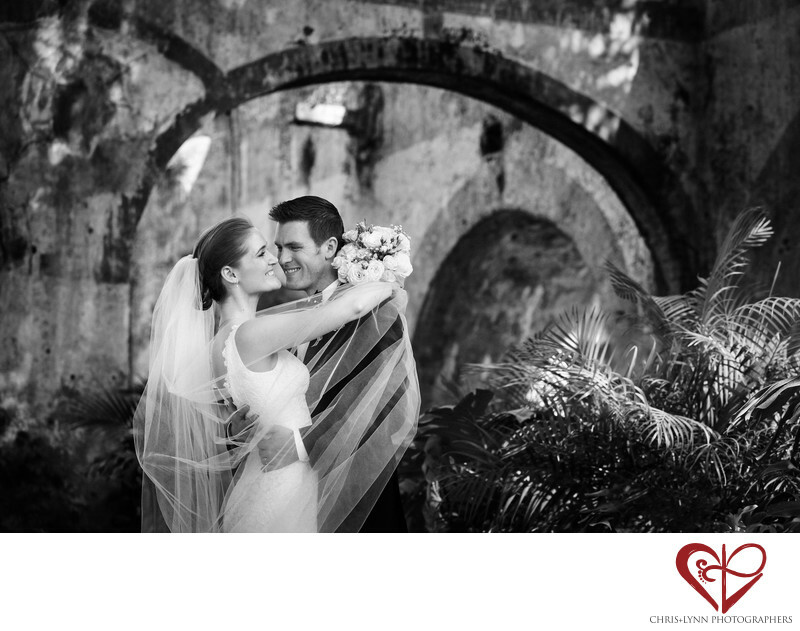 Cocoyoc sits at an elevation of 4,000 feet above sea level and boasts a spring-like average annual temperature of 68° F. The hacienda is an ideal location for small to medium sized Mexico destination wedding due to its easy access from Mexico City's Benito Jaurez International Airport. Location: Hacienda Cocoyoc, Carretera Federal Cuernavaca- Cuautla Km 32.5, Cocoyoc Centro, 62736 Yautepec, MOR, Mexico . 1/800; f/4.0; ISO 400; 90.0 mm.